Hoe may refer to various raw food dishes in Korean cuisine. Saengseon hoe is thinly sliced raw fish or other raw seafood (similar to Japanese sashimi); yukhoe is hoe made with a raw beef and seasoned with soy sauce, sesame oil, and rice wine; and gan hoe is raw beef liver with a sauce of sesame oil and salt. 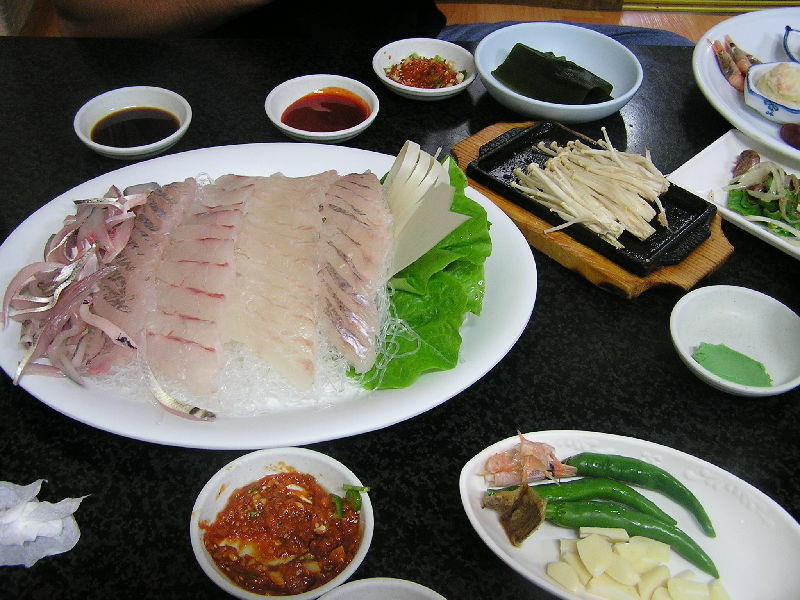 Left: Hoe - Korean style raw fish. Fish hoe is usually dipped in a spicy gochujang-based sauce called chogochujang, ssamjang, or wasabi ("Japanese horseradish") sauce, and wrapped in lettuce and Korean perilla leaves. To make hoe aesthetically pleasing, it is often served on of a mass of uncooked dangmyeon (cellophane noodles). When people finish a meal of saengseon hoe at a restaurant, they sometimes order maeuntang (spicy fish stew, from the fish heads and remaining meat) together with various vegetables.